It’s time for some updating and housekeeping chores at The Writerly Life. The home page has a slightly different look today: I moved some things around, got rid of the Tag Cloud (which seems to duplicate Categories, but maybe I’ll just start afresh), added a quick-access profile via Gravatar, and most importantly, a new widget called Community that shows all of you likers, followers, and commenters. It’s colorful and cheery and reminds me of why I’m here. It’s not a host of hundreds yet–but it’s growing! Overall, I hope the effect is cleaner and more efficient. You can let me know what you think. This little makeover calls for a big shout-out to all of you who have read these words and maybe even honored this effort by making The Writerly Life a regular stop on your blog rounds. That takes time and effort. Thank you, thank you! Some milestones reached this week—over 5,000 views and 65 posts, including an interview and some fine guest writers (all almost entirely since April 2012)—call for a hard look at the blog, where it is, and where it’s going. I am not a prolific writer here. Some of you put me to shame, posting every day! I will continue to write regularly, bringing you something original (I hope!) once a week and also sharing other sites that strike me as interesting and informative (like this one), words of wisdom regarding writing and the writer’s life, and photographs, including a regular series of photos as writing prompts. Look for a special guest post next week and another writing prompt coming soon (it’s a provocative photo; I think you’ll like it)! Occasionally, I’ll dare to drop in bits of original fiction or poetry. And who knows what else, because this writer’s house is a work in progress. 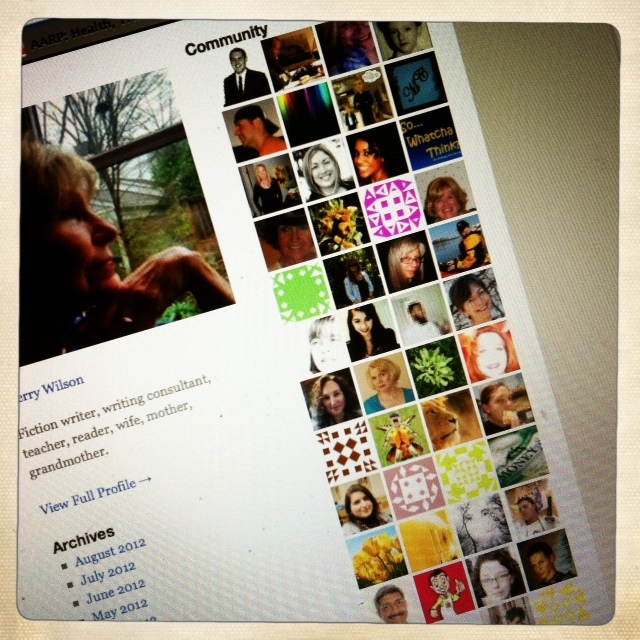 If you’re new here, follow the links in this post for a taste of what The Writerly Life is like. I’m always glad to see you here and read what you have to say. Thanks, E. B.! I guess it is amazing. And fun. That community widget is awesome! The blog looks great, Gerry! Keep up the good work! Thanks, Becca! Looking forward to next week. Cecilia, it was easy! Go to your Dashboard/Appearance/Widgets. You should see it there, although I guess it might depend on the theme you use. Drag/drop it on the area where you want it to show up–sidebar or one of the other designated widget areas (on the far right of my widgets screen; I don’t know about yours). I had to play with it some to get it where I wanted it, but it’s easy to go back into the Widget page and move it around. I thought it was “cool”! I love seeing all those faces and designs. Let me know if this works. Or I guess I’ll see, won’t I? If not, search WordPress help or their forums (as though you have time for that!). Thanks for stopping here. I always appreciate it! And to you, Esther. How do we stay so busy? We aren’t supposed to have to do that any longer, are we! Seems as if a few of us are in a (re)visiting mood. I always love to see how you move things around. One of these days, we will have to have a glass of sweet tea on the porch for real. Yes, just read your post today! You made me want to put a For Sale sign out and head for Hawaii. We could have that sweet tea on either side of the big water, couldn’t we! Yes, but read the caveats before you sell everything and head my way. Come visit a time or two. I’m even more expert on how to visit on the cheap. Thanks, Zetta. I really appreciate your stopping by. Impressing, Gerry. Not all of us can boast these figures. Good job. It’s funny how on any given day there may not be many views. But they do add up, and that’s encouraging! Thanks for stopping by, Claudsy!